The LBAZ and JBA hangers provide higher loads for 2x10, 2x12 and 2x14 members in 14-gauge and 18-gauge steel, respectively. The nail locations on the JBA enable effective use with nailers. The BA hangers are cost-effective hangers featuring min./max. joist-nailing options. Min. Nailing featuring Positive Angle Nailing targets moderate load conditions whereas the Max. Nailing generates capacities for higher loads. The unique two-level embossment provides added stiffness to the top flange. See tables. See Hanger Options for hanger modifications, which may result in reduced loads. JB/JBA — 18 gauge; LB/LBAZ — 14 gauge; BA — 14 gauge or 12 gauge. For modified hangers, gauge may increase from that specified for non-modified hangers. Hanger configurations, height and fastener quantity may increase from the tables depending on joist size, skew and slope. Embossments may be omitted. BA, HB, JB, JBA, LB and LBAZ — galvanized; BA, HB and LB may be ordered hot-dip galvanized; specify HDG. Use specified fasteners; see General Notes and nailer table notes. B, LBAZ and BA may also be welded to steel headers with weld size to match material thickness. The minimum required weld to the top flanges is 2" (1 7/16" for LBAZ) fillet weld to each side of each top flange tab. Distribute the weld equally on both top flanges. Welding cancels the top and face nailing requirements. Consult the code for special considerations when welding galvanized steel. The area should be well-ventilated (see General Instructions for the Installer, note k for welding information). Weld on applications produce the maximum allowable download listed. For uplift loads refer to technical bulletin Top-Flange Hangers Welded to Structural Steel Members (T-C-WELDUPLFT). Ledgers must be evaluated for each application separately. Check TF dimension, nail length and nail location on ledger. 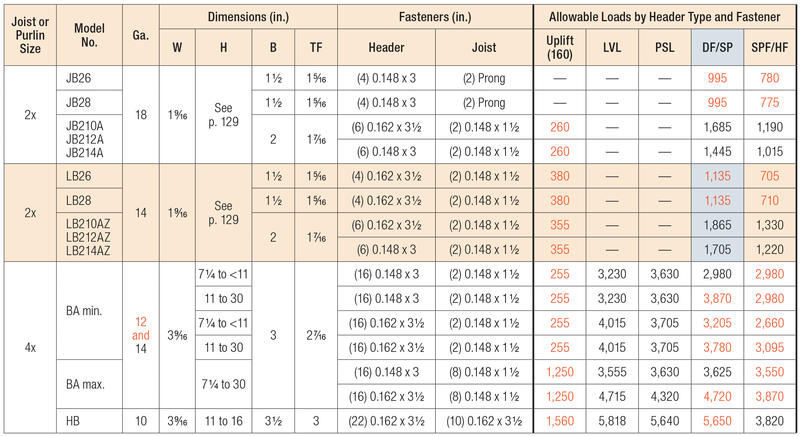 For modified hangers, fastener quantity may increase from the tables depending on joist size, skew and slope. Bevel cut the carried member for skewed applications. A technical bulletin including allowable download and uplift and installation information for many common top-flange joist hangers installed on wood nailers. A one-page technical bulletin describing the welding requirements and restrictions for attaching Simpson Strong-Tie top-flange hangers to structural steel hangers. The BA hanger can replace a stock-sized LBV (being discontinued and phased out by June 2019) in any application, as long as the two hangers are the same size. Uplift loads are based on DF/SP lumber. For SPF/HF, use 0.86 x DF/SP uplift load. Uplift loads are based on DF/SP. For SPF/HF, use 0.86 x DF/SP Uplift Load for products requiring nails and 0.72 x DF/SP Uplift Load for products requiring screws. Where noted for single-ply joist hangers, use (6) 0.148" x 1 1/2" nails. Uplift values are for DF/SP nailers only. Refer to technical bulletin T-C-NAILUPLFT for SPF values. For joist members 2 1/2" or wider, 0.162" x 2 1/2" joist nails should be installed for additional uplift loads on the 3x and 4x nailer applications of 970 lb. and 1,010 lb. respectively. 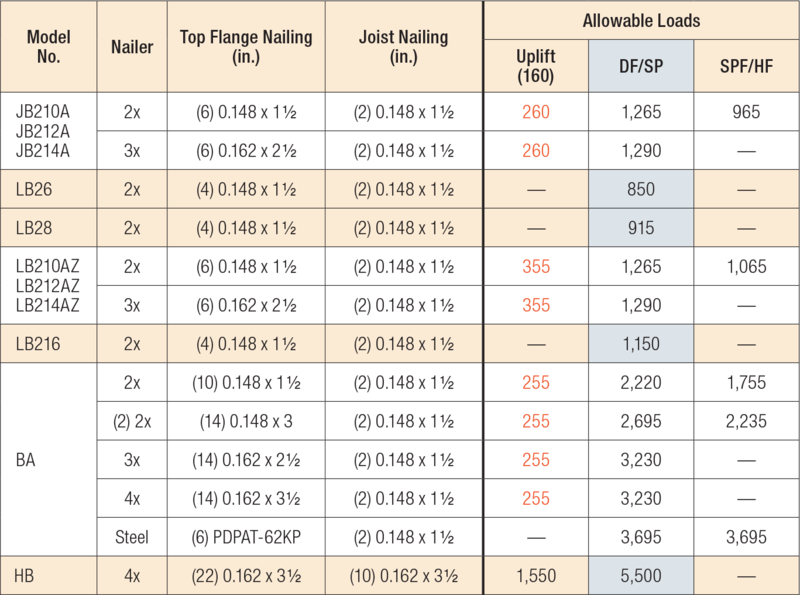 See technical bulletin T-C-NAILUPLFT for increased uplift loads with alternative nailing. Attachment of nailer to supporting member is by the Designer. = 0.90 x (Table Load) for BA with W < 2 1/2"
= 0.71 x (Table Load) for HB with W < 2 1/2"
Sloped down and skewed left with sloped top flange installation. BA See specific model numbers for code listings. JB See specific model numbers for code listings. JBA No evaluation report listing. LB See specific model numbers for code listings. LBAZ No evaluation report listing.